Which Pianists and Composers Have the Best Mustaches? Edward Macdowell (1860-1908), American composer and pianist whose major contributions include wonderful short pieces such as his Woodland Sketches and this amazing push-broom mustache. Artur Scnabel (1882 -1951), noted scholar, pedagogue, and performer. He was especially lauded for his interpretations of Schubert and Beethoven. Ignacy Jan Paderewski (1860-1941), a top-rate concert pianist also served as the Prime Minister of Poland. He even gave a few tidbits of advice concerning foreign policy and piano playing to U.S. president, Harry Truman. Igor Stravinsky (1882-1971), Russian pianist, composer, and conductor. His contributions to 20th century composition will leave an eduring legacy. This is me. This mustache is two weeks old. Note the lack of striking resemblance to Edward Elgar. Adam & Anna Bendorf are piano teachers in Santa Clarita, CA. They both prefer the clean-shaven look on Adam. November: the month in which otherwise clean-shaven men try their hand at that popular logger-who-works-in-the-office-cubicle look. It’s No Shave November, the month for bringing awareness to men’s health. Because I’ve been looking for an excuse to grow my mustache, I decided to celebrate No Shave November. I’ll be honest, it wasn’t as exciting as I thought it would be. Mostly because my wife didn't appreciate my kind hubby pecks on the cheek. Not that I can blame her. My ‘stache must have been shocking, considering I have amazing baby soft skin like those dudes in the Gillette commercials. Sometimes I wonder why Gillette hasn’t cast me in one of their commercials. Probably because I don’t like their razors. And I bet they know that because of Google somehow. Or the Hubble telescope. 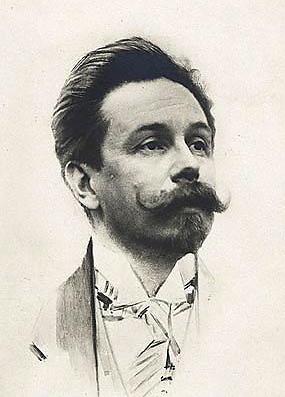 Anyway, in honor of the hairy eleventh month, I am posting about great composers and pianists with amazing mustaches. These fellas encapsulate the very best of pianism and mustacheianism. Alexander Scriabin (1872-1915), a Russian pianist and composer who made interesting assertions that the key relationships through the circle of fifths also follow a color spectrum. For example, the key of C is red, G is orange, D is yellow, A is green, etc. Edward Grieg (1843-1907), the Norwegian composer who's nationalistic music made him a popular hero of his home country. Though best known for his immensely popular work, In the Hall of the Mountain King, he actually did not like the piece. Note the striking resemblance to Einstein in this photo. Edward Elgar (1857-1934) was an English composer. His "Pomp and Circumstance" march has garnered much fame in the U.S. as the processional tune for graduation ceremonies.